Make your message known and seen by everyone with aluminum signs. Aluminum signs are not just for signage on the streets or highways, they are also ideal for stores, receptions, open houses, and even for parking lots. 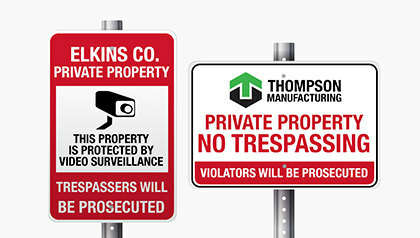 Print property signs to keep unauthorized people out of your place of business or private property. Parking signs help inform motorists of your parking facility rules and regulations and improve traffic flow. 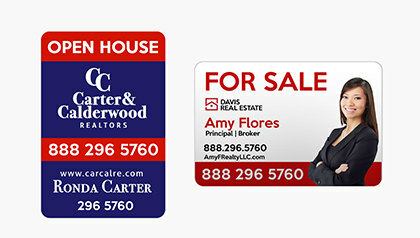 Real estate signs help show off your latest property for sale. Two kinds of aluminum— standard or reflective —so you can customize your metal signs according to its application and function. Three sizes. With 12” x 18”, 18” x 24”, and 24” x 36” sizes offered, you have a wide variety of choices for your specific needs. Three hole drilling locations. Make installation a breeze and pick from top corners, center top and center bottom, and all corners. It’s long-lasting. Aluminum is known for its strength and rigidity making signs rust-proof, rot-free, weatherproof, and chemical-resistant. It’s no surprise that these sturdy custom metal signs can stand the test of time. It’s super affordable. 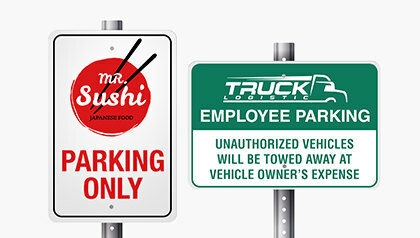 For the level of durability and longevity, the cost of these aluminum signs doesn’t put a dent in your pocket. It adds a professional edge. Even if aluminum sign printing won’t cost you a fortune, it does look the part. It exudes a professional look that feels high end. It’s versatile. Custom metal signs are versatile because they can be used in a variety of businesses and applications. They can hold up to extreme weather without showing signs of wear and tear. This makes aluminum signs ideal for both indoor and outdoor use.